BOB ABERNETHY, anchor: While religious conflict is dominating the headlines, there are some who are trying to find understanding and respect across religious lines. A group of women in Cambridge, Massachusetts is doing just that. 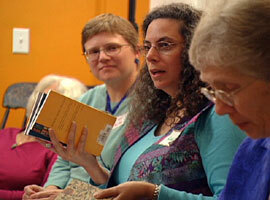 They have founded a book club to learn from each other’s Jewish, Christian and Islamic traditions. Betty Rollin has their story. BETTY ROLLIN: They call themselves the Daughters of Abraham — Jews, Christians and Muslims who gather once a month in Cambridge, Massachusetts to talk about books. Not just any books. Whether fiction or nonfiction, the books they read are about their three religions. The Daughters of Abraham book club was the brainchild of Edie Howe, a lawyer turned divinity student. The idea came to her the night of 9/11, when she attended an interfaith service. EDIE HOWE: I was deeply moved by the events of the day and by the service, and I asked myself, what can I do to make a difference in the light of the horror of this day? And I thought of Abraham and the fact that Jews, Christians and Muslims are essentially children of Abraham. And I thought, well, I’ve been running a book group for 10 years. I could run a women’s book group that would be composed of Jews, Christians and Muslims. Maybe that would make a difference. Reverend MARY MARTHA THIEL (in book club discussion): I loved this book. It has the quality of just deep respect and listening that we try to embody, and I found it a profoundly moving book. ROLLIN: Mary Martha Thiel is a United Church of Christ minister. The other women are physicians, social workers, teachers. One is a rabbi, one is a real estate broker — all of them eager to learn about each other’s faiths. Rona Fischman is Jewish. RONA FISCHMAN: It’s far more than just the reading. It’s meeting outlooks that I never met before, hearing points of view that I would never meet in the normal course in my life, and over the years we’ve really become a caring community. Reverend ANNE MINTON: It has been one of the most wonderful experiences of my life. ROLLIN: Anne Minton, a former Catholic nun, became an Episcopal priest and is now retired. Rev. MINTON: Getting to know them, hearing about their faith and the practice of their faith has been so strengthening of my own faith. Being with Muslim women, for example, who pray regularly five times a day helps me remember a rhythm of prayer in my own life. ROLLIN: Sepi Gilani, a physician, is a Muslim from Iran. A book that especially resonated with her is LYING AWAKE by Mark Salzman, about Catholic nuns. Dr. SEPI GILANI: As I was reading I thought, oh, these nuns are kind of like my grandmother. After my grandfather died, she would spend a lot of time in prayer, and so you can kind of see those similarities even though one is a story about a nunnery and my grandmother is a Muslim, a devout Muslim widow. You can see the similarities. So that’s an eye opener. Ms. FISCHMAN: I’ve gotten some of prejudices eroded. I grew up skeptical about Christians, because I was sort of taught that they all were covert missionaries in some way and that they’d love to have me convert, and that really has eroded. Ms. HOWE: What surprised me was how quickly relationships formed among the women. There were personal difficulties — that women of one faith tradition would go over to the home of a woman of another faith tradition, leave food, sit down and talk. Ms. FISCHMAN: In 2003 I just had a bad year. I had a very dear friend and family members all terminally ill and dying one after another. So we didn’t have people in the house unless we were in mourning. And a number of people in the group were here for the mourning. But more importantly they were here for advice, you know, when my life was changing. And having people who are centered in God, who have a big perspective on the world, to tell you, you know, we go through it and you’re okay was even more valuable than people showing up with food. 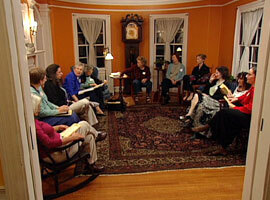 ROLLIN: The women have learned to see Abraham through the eyes of each other’s faiths. Ms. HOWE: It’s wonderful to see, for instance, the story of Abraham and Isaac and the different ways that’s told. For the Muslims, it’s all about Ishmael, and for the Jews and Christians, it’s about Isaac. ROLLIN: One surprise for the women has been the commonalities among the three religions even though the rituals are different — the way sin and forgiveness are dealt with, for example. Rev. MINTON: As a Catholic, when I would go to confession I believed that the grace of God came through priest. ROLLIN: Muslims don’t go to confession as Catholics do but try to be better people in their own way. Dr. GILANI: Because there is no concept of original sin, you can always — if you’ve had a horrible past, you’ve done a lot of ill deeds in the past you can always make up for it by doing more good than bad. ROLLIN: Jews, especially during the High Holidays, are also bent on self-improvement. Ms. FISCHMAN: We are preparing for the New Year cycle, which is very much about getting back on the path. The language is almost the same. It’s turning around. Ms. HOWE: One very strange thing that has happened to me is that I now think in a sort of 3-D paradigm. I cannot think about Christianity without thinking about Judaism and Islam. It is — they are inextricably linked in my mind forever, I guess. ROLLIN: There is in this group an agreement to avoid conflict. Still, there are differences among the Daughters of Abraham, and there is occasional friction. Ms. FISCHMAN: The frictions that I would have imagined were between Christians and Muslims or between Jews and Muslims or between Muslims and Christians. And actually the friction that we’ve had were in the same religious cohort — that we’ve had liberal Protestant Christians saying dismissive things about Catholics. We’ve had Conservative Jews saying dismissive things about Reform Jews. ROLLIN: The word is out, and the Daughters of Abraham are growing. There are now five groups in the Boston area. Trips have been taken both to Jerusalem and to Spain, where the women visited holy sites of all three faiths, and other trips are planned. 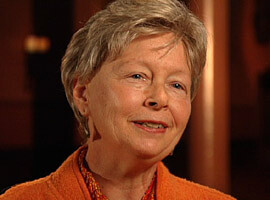 Ms. HOWE: I believe it is very important for Jews, Christians and Muslims to learn about each other. If you look in the world today, there is profound misunderstanding. There’s an enormous amount of prejudice, and this book group is my undertaking to try to reduce that to the extent that I am able. ROLLIN: For RELIGION & ETHICS NEWSWEEKLY, I’m Betty Rollin in Cambridge, Massachusetts.